The history of Telrad, Inc. is really a story about Steve Kufeld and his development of the Telrad sight. The beginnings of Telrad, Inc. originate in the late 1970's when Steve Kufeld of Huntington Beach, California came up with the idea to manufacture an economical sight to help amateur (and professional) astronomers find their way across the night sky. Steve based the Telrad sight concept on World War II vintage aircraft sight technology which he had purchased as surplus; he simply came up with a new application for it. 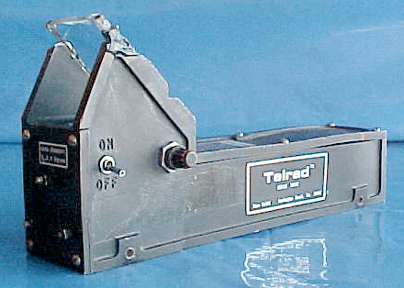 Right: The original prototype Telrad sight, viewed from left rear showing: on/off switch, dimmer, and screws (at front) to permit the adjustment of projected reticle position on the window (100,342k). The Telrad sight concept involves projecting a sight pattern (see this in our description of the Telrad sight) onto a transparent window. When properly set up and aligned to a telescope the pattern appears to be floating in the sky superimposed over the star field. By the late 1970's Steve had completed prototype of what what to become known as the "Telrad" sight. Steve continued his development work, as in the meantime he also enjoyed associating with fellow amateur astronomers. As a member of the Los Angeles Astronomical Society (www.laas.org) which owned land in nearby Lockwood Valley, Steve had access to a good dark sky location to observe and where to socialize - it was here where he tested the first Telrad prototypes. Steve even made the time to serve the society as Secretary for a time. While Steve had access to larger telescopes owned by the LAAS he also owned a Dobson reflecting telescope, and later on he acquired an Astro-Physics 6 inch f12 Triplet Apochromat refractor, and a 12 inch Schmidt-Cassegrain telescope. Above: first production Telrad Sight, viewed from right rear. Removable base not shown. Note On/Off switch, brightness adjustment dial, and three reticle positioning screw at rear (125,975 bytes). The first production Telrad sight was made in house. The Telrad components were formed into urethane models, from which were cast the parts in aluminum. This would be the basic form of the Telrad sight as it has become recognized today. The Telrad as marketed includes a removable platform that can be bolted, glued, or strapped onto the telescope; this permits one to quickly remove the Telrad to facilitate transport of a telescope or to move the Telrad sight from one telescope for use on to another telescope. The first production Telrads incorporate holes on the side to permit one to fasten the sight onto the base; this was later changed to a dovetail design with two nylon set thumb screws. Left: Current production Telrad Sight, viewed from above, right (20,878 bytes). Soon afterwards, an ABS plastic injection mold was made. Since about 1982 this is the basic form of the Telrad which would not be altered to the present day. And since then Telrad has found better ways to make the sight, increased production volumes and improving economy of scale, and so the $48 cost of the sight has remained the same! 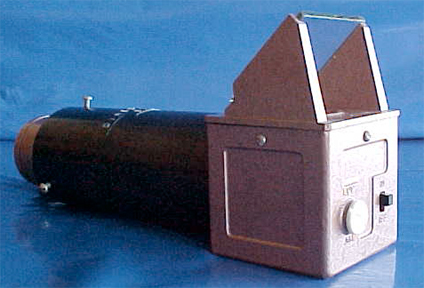 With advertising appearing in the popular astronomy magazines by 1983, the Telrad sight gradually grew in popularity to become the dominant sight employed in the amateur astronomy community of deep sky observers. By the time of Comet Halley's last visit (1984 to 1985), the Telrad became the standard sight suggested by Company Seven for use by those who would seek to learn the sky with a deep space capable telescope! We recall many times calling Steve to ask "how long before he would finish assembling the next batch of Telrads?" The three circle reticle pattern has become so familiar in the astronomy community that several published star charts and astronomy software programs now include (or offer as an option) transparent overlays for use with the star charts to aid the user in learning angular measurement, and then how to "star hop" from one object to another. Some of our customers have adapted the Telrad sight for uses we never anticipated for example stage lighting technicians adopted the Telrad to help them point spot lights in the theatre. Third parties began to offer options for the Telrad including: blinking circuits to pulse the Red L.E.D. on and off, dew shields, dew shields incorporating adjustable mirrors to facilitate observing areas overhead, and heaters. Steve never chose to compete with these third parties, instead their help was welcome. By 1992 Telrad production occupied all of Steve's work day, and so in 1993 the now incorporated Telrad, Inc. would put "Pine Mountain Club, California" (a private community in Los Padres National Forest, just north of L.A.) on the astronomy map! On June 30, 1999 at age 57 Steve was taken ill and passed away. Since then, the Telrad company has continued with the efforts from his employee who shares ownership of Telrad, Inc.